Thanks to Dan James for sharing his story and pictures with us. 11/18/2011 was a beautiful day and I was riding to work as I usually do, wearing my Fox Creek Leather Motorcycle jacket, helmet, gloves, etc. As I was going down the hill from my house to get on the highway, I noticed a long line of traffic at the on ramp I usually take and decided that day to take an alternate route past the traffic. Well, just after I passed a traffic light, a car in that long line of traffic decided it wanted to be in my lane as well. I hit the brakes as hard as I could but knew it was too late and, next thing I knew, I was laying on my back in the middle of the road with a couple of guys standing over me telling me to stay down. I thank God I was wearing my Fox Creek Leather jacket that day because it kept the skin on my back and arms and the lower lumbar pad probably prevented me from breaking my tailbone. The jacket was pretty scarred up and I left it in the closet for a while as I was recuperating. When I finally got to the point that I thought I might be riding again shortly, I got in touch with Fox Creek and asked what I could do to restore the jacket to its previous glory. Fox Creek quickly responded that they would send me some Doc Bailey’s Leather Black for FREE. I took them up on that offer without hesitation. Doc Bailey’s is pretty easy to use. It comes with an applicator and a bottle of the blackening solution. All I had to do was put the solution on the applicator and rub it into the jacket. I’ve shined a lot of shoes/boots in my life and this was a lot easier than that. Just rub it in until the solution returns the color to the material. 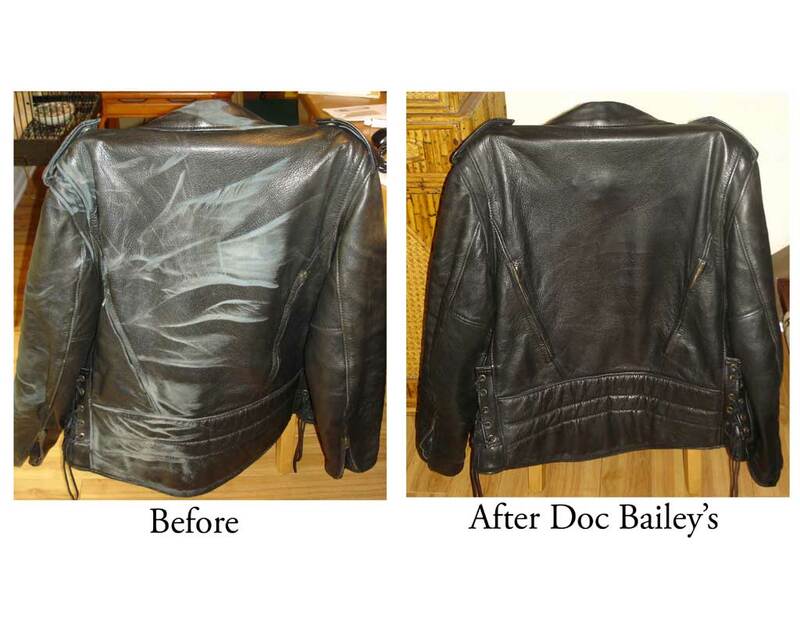 My jacket still bears the scars of that day but Doc Bailey’s really brought the color back to the jacket and this stuff is much better than shoe polish because it doesn’t leave a residue that rubs off on hands, fingers, clothes, etc.